I’m really appreciating the Qlik Sense Mashup facility. In the simplest case, mashups are when you embed Sense charts in a web page. Super easy with Sense. Perhaps you’ve created some charts in your app that exist solely to serve the mashup. What if you want to display these charts in the mashup but you don’t want them showing in a sheet when the app is viewed via the hub? How to make these charts available to the mashup but not appear in the “app”? Simple. After creating the chart, make it a Master Visualization and then delete it from the sheet. The mashup can use the Master Viz Id to reference the object. 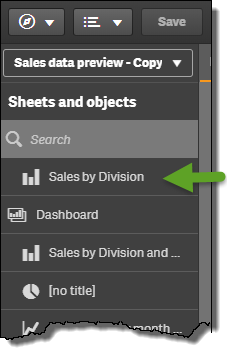 If you are using the Dev Hub Mashup editor, note that Master Visualizations appear at the top of the “Sheets and Objects” list, before the first Sheet. 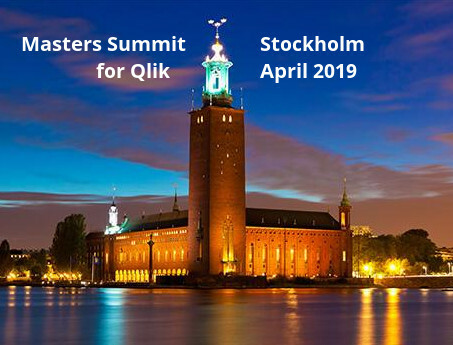 One of the benefits of attending the Masters Summit for Qlik is networking and the things you can learn from discussions with peers. At the Boston Summit, I was fortunate to meet Erik Wetterberg, formerly of Qlik R&D and known to me as the author of the qsVariable and DevTool extensions. I’ve been a fan of the DevTool extension for some time and had a nice chat with Erik about potential enhancements to DevTool. Since the summit Erik has made some updates and accepted new function I’ve added to the tool. 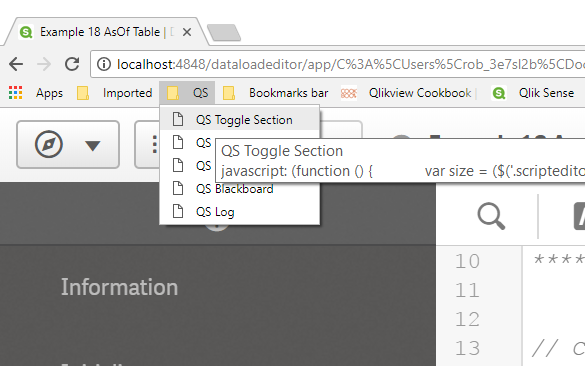 DevTool provides some functions that are useful during Qlik Sense app development and debugging. Download the DevTool zip from the dist folder here https://github.com/erikwett/DevTool and install as you would any other extension. Add the extension to any sheet and it will create an Action Button (AB) to the lower right corner of the sheet. You don’t have to leave the extension in the app, the AB will remain until you close the app. I usually don’t leave it in the app, I just add it and then remove by double clicking DevTool in the assets panel and follow that with a Ctrl-z undo. You can leave it in the app if you wish. There are some considerations discussed below for leaving it in a published app. Clicking the AB will toggle a tooltip above each sheet object that initially displays the objectid. The objectid is useful when building mashups or reviewing diagnostic data. As selections are made and the objects are recalculated, the tooltip will add a line showing the time in milliseconds for the current calculation as well as the max calculation time for this object. Click the “properties” button on the tooltip and this object’s json formatted properties will display in a popup. Use the copy-to-clipboard button to copy all or selected property lines to the clipboard. Exporting script to a text file. Importing (replacing) script from a text file. Exporting variables in script or json format. The extension works equally well in desktop or server. Some things to think about before including it in a published app. Users normally can’t see the load script and variables in a published app, but they can with this extension. Although the script import works without error in a published app, the change to script is not saved so effectively nothing has been updated. For myself, I’ve been thinking of this as a tool to use during development only and have not been including it in published apps. I’d be curious to hear if someone has made a different decision. The extension buttons use a google font. I note that many servers are blocked from the internet. If this is your case, you will see red dots for the buttons instead of proper symbols. The buttons are still fully functional. Maybe I’ll see you at the Masters Summit in Prague where you might find your own interesting collaboration. In January I attended (review) Nick Webster’s “Web Development for Qlik Developers” course. I found the course extremely valuable so I’m bringing Nick to San Francisco September 19-22 for a four day fast track course. Are you a Qlik Sense Developer that wants to understand how to use the various QS APIs to create your own mashups, portal integrations or custom content pages that leverage data from Qlik Sense? 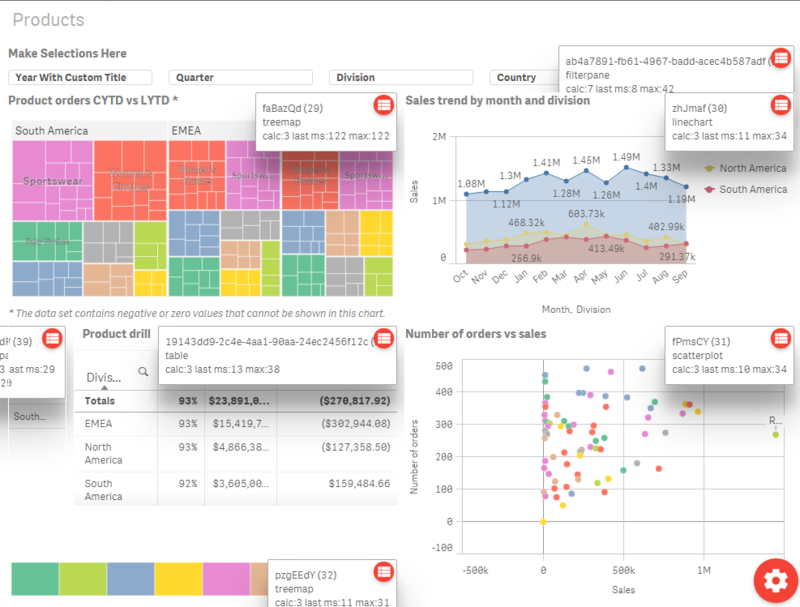 Do you want to create your own QS Visualization Extensions or modify existing extensions? The differences and application of the various QS APIs e.g. Capability, Visualization, Engine. Important QS core concepts such as the generic object model. Connecting to the QIX engine to retrieve existing content or generate associative aggregations (hypercubes) on the fly. You’ll come away with example code and your own completed exercises giving you the confidence to move ahead on your own. No prior experience with web programming is required as the course will provide an intro to those technologies and how they are used in Qlik Sense Web Development. Course fee, location and registration here. Don’t wait, as the class is limited to 10 students! When I started with QlikView (V7), we sometimes wanted to operate on data other than the current selections. We accomplished this with the ALL keyword and complex if() functions. It usually did the job but slow, resource intensive and frequently complex to code. Along came Set Analysis in QV8.5. Brilliant! Performance problem solved! We still wanted to do comparative analysis, something not directly supported by Set Analysis. So we resorted to loading fields a second time in a data island. Once again, slow, complex if() functions. Along came the Alternate States feature in QV11. Brilliant! Performance problem solved! 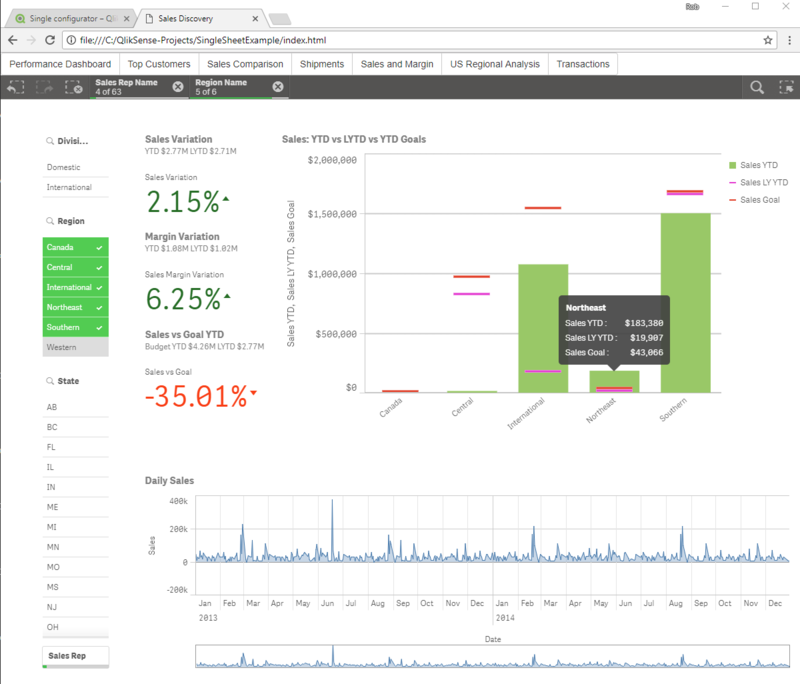 The Qlik Sense client does not yet support Alternate States. We know the backend QIX engine supports Alternate States, but accessing the feature outside the client is beyond the reach of most QS Developers. Now going “back to the future”, we see very smart QS developers creating patterns for doing comparative analysis in QS using data islands. It’s good work. But it’s coding gymnastics. Data islands come at a cost, inflating and complicating the data model and consuming additional server Cache and CPU. So here is my pitch to the QS Product Team at Qlik: We know that data islands can be a performance pitfall. 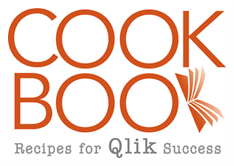 We’ve seen the problem and the solution in QlikView. Can we skip the “adversity will make you stronger and smarter” phase and just expose Alternate States in the QS Client? Now please? Like Karl Pover, I’m curious to learn more about writing Qlik Sense extensions and other opportunities to use the Sense APIs. I’ve created some throwaway examples in class, usually working directly in the Sense/Extensions directory. First, my extension project. 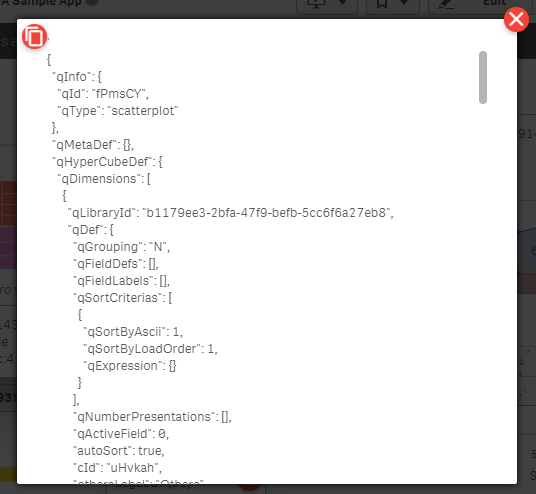 I like the script export/import function in QlikView script editor and have missed this function in Sense. So I created a extension that provides buttons to Export and Import script to text files. Yes, it’s true — a “Visualization Extension” that visualizes nothing. 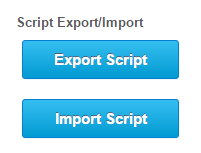 You can click “Export Script” to send the current script to a text file, and “Import Script” to replace the current script from a text file of your choosing. You can also drop a text file on the Import button. You can find the extension with download links here. On to the focus of this post, which is “how-to”. All my files; js, css, etc are prefixed with this namespace prefix. The “name:” property of the required .qext file provides a friendly name that will display in the Assets panel. I chose the shorter “Export/Import Script” for the name. An extension lives inside a larger application and must play well and share with others. It’s not a good idea to name your html Div “output” as you may collide with others who use the same name. I used the same prefix for any elements that may have a scope outside my extension, specifically html ids and css class names. The Qlik Help has some recommendations on this topic. I looked a a number of different directory structures on github that other folks had used for existing extensions. I settled on the layout recommended by Stefan Walther in the documentation for his sense-go tool. The design made sense and I was also interested in using the sense-go tool for building. I used a couple of external libraries in the project to handle the file download and the drag&drop function. Instead of referencing those libraries with html links, I learned how to use require.js, an integral tool in the coding patterns of Qlik Sense. I also used require.js to load my css and html files. It’s a great tool. The standard way of writing code is to write your source code in one location and then prep and package the files into an installation or runtime bundle. There are many advantages to following this pattern. We also want a way to automatically redeploy the updated code to the Sense desktop or Server for testing, and upload a release package when ready. As a starter build & deploy process, I chose Stefan Walther’s sense-go tool. In addition to automating the process, I found the task chain to be a good knowledge transfer from an experienced Sense developer. Everyone has a favorite editor, I tried a few on this project. I found I liked vscode best. For managing the git repository, I used GitHub Desktop. You may like another tool or be a command line fan. If you are starting out writing extensions, I hope these notes help give you some direction. Note; This extension has been deprecated in favor of the DevTool extension which provides the same functionality and more.